There’s definitely no shortage of amazing homes to ogle over from your desktop (especially when on 6sqft), but how often do you actually get to experience one of these places up close and personal? 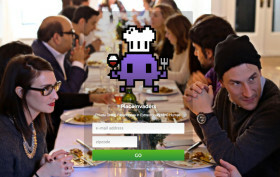 PlaceInvaders is a cool new local startup that gives us regular folks the keys to some of the city’s most incredible apartments. Here individuals are invited to schmooze with fellow NYC inhabitants while also wining and dining on often experimental fare. PlaceInvaders recently brought foodies into Cindy Gallop’s infamous “Black Apartment,” while another event found a group eating delicious moose pot pie (yes, you read that right) in an artist’s loft overlooking the Brooklyn Navy Yard. 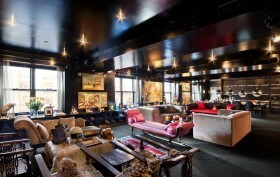 New York City’s most famous bachelor pad—ironically owned by a woman—is back after being taken off the market earlier this year. The distinctive $5.995 million loft at 213 23rd Street, formerly the men’s locker room of the first YMCA in the U.S., was purchased by businesswoman Cindy Gallop in 2006 for $1.5 million. With an additional million, and the help of Stefan Boublil of interior design firm The Apartment, she gave the space a dramatic makeover, stating she wanted to feel like she was in a Shanghai nightclub. Its resulting “lacquered Chinese box” vibe has earned the Black Apartment a featuring role in Law & Order SVU, Notorious B.I.G’s “Nasty Girl” video, and many photo shoots. The notable home has undergone quite a transformation, rendering it practically unrecognizable as it prepares for a new owner, but let’s take a moment to admire its former interior in all its glitzy splendor.